The so-called “dural tail sign” (DTS) is a thickening of the dura that is most often seen adjacent to a meningioma. Although the DTS is highly specific for meningioma, it has been observed in numerous other intracranial lesions. The origin of the DTS is an issue of debate. Some authors have described it as a tumor extension, while others have considered it as a proliferation of connective tissue, hypervascularity, and vascular dilatation within the dura and adjacent to cranial masses. Here, we reported a rare case of glioblastoma multiforme (GBM) with image findings of a DTS. A 74-year-old female was taken to our hospital due to the sudden onset of mental status change and right-side hemiparesis. Brain magnetic resonance imaging (MRI) with contrast enhancement showed an intracranial mass with heterogeneous enhancement in the left temporal lobe which was consistent with the DTS. A left frontotemporal craniotomy was performed, and grossly total tumor removal was achieved. The final pathology reported was GBM. Although it is rare, GBM may also on occasion be associated with a DTS. The histopathological examination for DTS in GBM is limited. Currently, excision of the dural tail in GBM is suggested. Glioblastoma multiforme (GBM) is one of the most frequent intraparenchymal tumors. GBM can extend to the dura and rarely shows dural thickening or the DTS., Interestingly, these studies found no involvement of the DTS with tumoral cells. This may suggest that the DTS associated with GBM has a different pathophysiology to the DTS associated with other conditions. Here, we report a case of GBM with hemorrhage in which the initial MRI showed characteristic findings of the DTS. A tentative diagnosis of atypical meningioma, hemangiopericytoma, angiosarcoma, or other hypervascular metastases was made. During surgery, an infiltrating tumor was encountered and removed. The final pathological diagnosis was GBM. The clinical and pathological findings are described along with a review of the associated literature. A 74-year-old female was admitted to our hospital due to sudden onset of mental status change and right-side hemiparesis. She had a history of hypertension that was controlled by regular medication. On arrival, the patient was alert but confused. Right-side hemiparesis was noted. 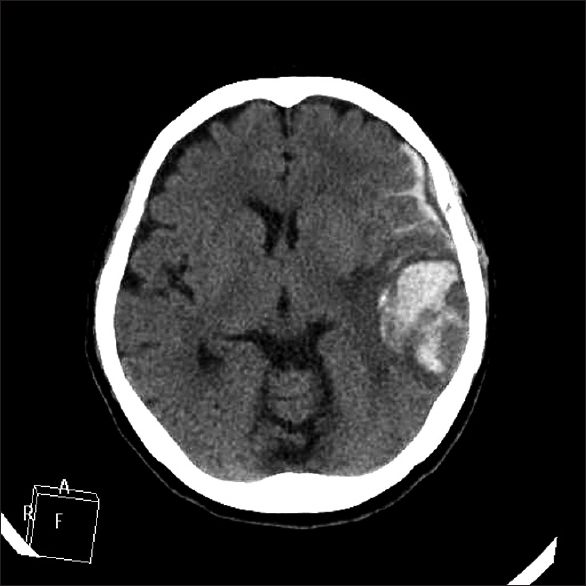 A brain computed tomography scan revealed an intracranial mass with hemorrhage in the left temporal region [Figure 1]. The presence of an intracranial mass with hemorrhage was confirmed by a brain MRI with contrast enhancement compatible with computed tomography images, which also revealed heterogeneous enhancement in the left temporal lobe. A DTS was noted, and we made a tentative diagnosis of atypical meningioma, hemangiopericytoma, angiosarcoma, or other hypervascular metastases [Figure 2]a and [Figure 2]b. A left frontotemporal craniotomy was performed. During surgery, an infiltrative mass with recent hemorrhage was encountered. There was no clear margin between the tumor and its surrounding parenchyma. Adhesion of the tumor to the meningeal layer of the dura was strong and dural invasion could not be excluded. The dural invasion was removed until grossly normal dura was encountered. The pathology report described a hypervascular tumor composed of highly atypical cells with enlarged/rounded nuclei, a coarse chromatin pattern, and fibrillary cytoplasm. Increased mitotic activity of up to five mitotic figures per 10 HPFs was observed. High tumor vascularity and focal hemorrhage necrosis were also apparent. The immunohistochemical analysis demonstrated that the tumor cells were diffusely positive for glial fibrillary acidic protein stain but negative for cytokeratin stain. Leukocyte common antigen CD34-positive findings highlighted proliferative endothelial cells in vascular channels. The overall picture confirmed the diagnosis of GBM. Microscopically, it showed some meningeal tissues involved by glioblastoma cells [Figure 3]. The patient recovered quickly after surgery; both her mental condition and motor functioning returned to normal. The patient underwent adjuvant chemotherapy with temozolomide and whole-brain radiotherapy for 42 days. Three months later, a brain MRI showed total removal of the tumor without recurrence. Of the two studies that have reported the appearance of the DTS in patients with GBM, involvement of the DTS with tumoral cells was not observed., The proliferation of connective tissues and vessels within the dura adjacent to cranial masses may be considered as the pathophysiology of DTS in patients with GBM. However, the case presented here showed the involvement of the DTS with tumoral cells. Extent of tumor resection is one factor that influences survival in newly diagnosed adult patients with GBM. Indeed, Lacroix et al. found that an extent of resection of 98% or more for GBM was associated with a good chance of survival. Surgical resection of GBMs relieves the mass effect, pathologically confirms the diagnosis, and sets the stage for multimodal adjuvant therapy.,,, Poor prognostic factors for survival include a higher age (particularly >75 years), chronic obstructive pulmonary disease, preoperative motor, language, and cognitive deficits, as well as a Karnofsky Performance Scale score of <80 and a tumor diameter larger than 4 cm. We performed wide excision for malignant glioma, including the adjacent dural thickening, in a patient with GBM. The final pathology showed some meningeal tissues involved by glioblastoma cells. Involvement of the DTS with tumoral cells has not previously been reported in patients with GBM with DTS. Wide excision including the thickening dura is suggested for dura-based tumors, especially tumors with DTS. The auther thanks Dr. Yue-hong Zhou at the Department of Pathology, Far Eastern Memorial Hospital, New Taipei, Taiwan for his assistance in histopathological findings of this case. Wilms G, Lammens M, Marchal G, Van Calenbergh F, Plets C, Van Fraeyenhoven L, et al. Thickening of dura surrounding meningiomas: MR features. J Comput Assist Tomogr 1989;13:763-8. Goldsher D, Litt AW, Pinto RS, Bannon KR, Kricheff II. Dural “tail” associated with meningiomas on Gd-DTPA-enhanced MR images: Characteristics, differential diagnostic value, and possible implications for treatment. Radiology 1990;176:447-50. Perry JR, Bilbao JM. Metastatic alveolar soft part sarcoma presenting as a dural-based cerebral mass. Neurosurgery 1994;34:168-70. Bauer J, Johnson RF, Levy JM, Pojman DV, Ruge JR. Tuberculoma presenting as an en plaque meningioma. Case report. J Neurosurg 1996;85:685-8. Sandhu FA, Schellinger D, Martuza RL. A vascular sarcoid mass mimicking a convexity meningioma. Neuroradiology 2000;42:195-8. Lath CO, Khanna PC, Gadewar S, Patkar DP. Intracranial metastasis from prostatic adenocarcinoma simulating a meningioma. Australas Radiol 2005;49:497-500. Shaia J, Kerr PB, Saini A, Roberti F, Kapil J, Jones R, et al. 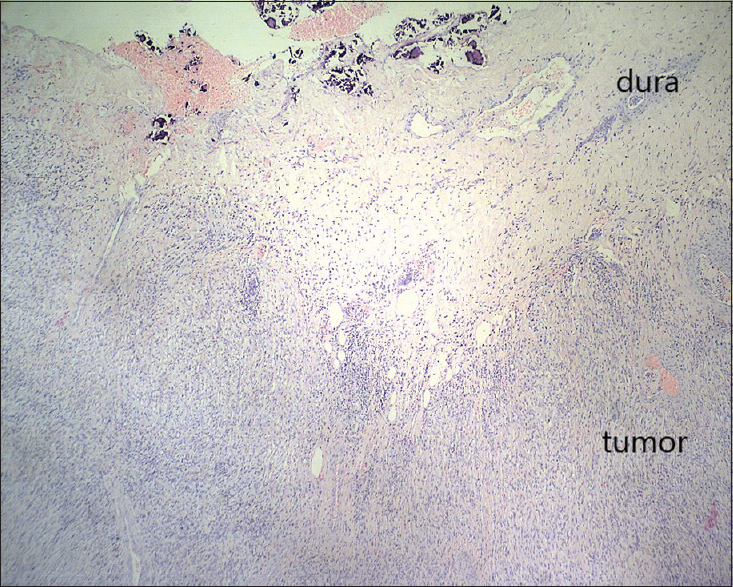 Mucosa-associated lymphoma tissue of the dura presenting as meningioma. South Med J 2010;103:950-2. Takei H, Schmiege L, Buckleair L, Goodman JC, Powell SZ. Intracerebral schwannoma clinically and radiologically mimicking meningioma. Pathol Int 2005;55:514-9. Youkilis AS, Park P, McKeever PE, Chandler WF. Parasagittal ependymoma resembling falcine meningioma. AJNR Am J Neuroradiol 2001;22:1105-8. Zeng X, Mahta A, Kim RY, Saad AG, Kesari S. Refractory seizures due to a dural-based cavernoma masquerading as a meningioma. Neurol Sci 2012;33:441-3. Murali R, Jones WI, Ma Wyatt J. A 57-year-old man with a dural-based parietal lobe tumor. Brain Pathol 2007;17:460-3, 474. Gupta S, Gupta RK, Banerjee D, Gujral RB. Problems with the “dural tail” sign. Neuroradiology 1993;35:541-2. Wilms G, Lammens M, Marchal G, Demaerel P, Verplancke J, Van Calenbergh F, et al. Prominent dural enhancement adjacent to nonmeningiomatous malignant lesions on contrast-enhanced MR images. AJNR Am J Neuroradiol 1991;12:761-4. Aoki S, Sasaki Y, Machida T, Tanioka H. Contrast-enhanced MR images in patients with meningioma: Importance of enhancement of the dura adjacent to the tumor. AJNR Am J Neuroradiol 1990;11:935-8. Nägele T, Petersen D, Klose U, Grodd W, Opitz H, Voigt K, et al. The “dural tail” adjacent to meningiomas studied by dynamic contrast-enhanced MRI: A comparison with histopathology. Neuroradiology 1994;36:303-7. Schörner W, Schubeus P, Henkes H, Lanksch W, Felix R. “Meningeal sign”: A characteristic finding of meningiomas on contrast-enhanced MR images. Neuroradiology 1990;32:90-3. Rokni-Yazdi H, Sotoudeh H. Prevalence of “dural tail sign” in patients with different intracranial pathologies. Eur J Radiol 2006;60:42-5. Kuroiwa T, Ohta T. MRI appearances mimicking the dural tail sign: A report of two cases. Neuroradiology 2000;42:199-202. Morioka T, Matsushima T, Ikezaki K, Nagata S, Ohta M, Hasuo K, et al. Intracranial adenoid cystic carcinoma mimicking meningioma: Report of two cases. Neuroradiology 1993;35:462-5. Kawahara Y, Niiro M, Yokoyama S, Kuratsu J. Dural congestion accompanying meningioma invasion into vessels: The dural tail sign. Neuroradiology 2001;43:462-5. Rokni-Yazdi H, Azmoudeh Ardalan F, Asadzandi Z, Sotoudeh H, Shakiba M, Adibi A, et al. Pathologic significance of the “dural tail sign”. Eur J Radiol 2009;70:10-6. Tokumaru A, O'uchi T, Eguchi T, Kawamoto S, Kokubo T, Suzuki M, et al. Prominent meningeal enhancement adjacent to meningioma on Gd-DTPA-enhanced MR images: Histopathologic correlation. Radiology 1990;175:431-3. Sekiya T, Manabe H, Iwabuchi T, Narita T. The dura mater adjacent to the attachment of meningiomas: Its enhanced MR imaging and histological findings. No Shinkei Geka 1992;20:1063-8. Hutzelmann A, Palmié S, Buhl R, Freund M, Heller M. Dural invasion of meningiomas adjacent to the tumor margin on Gd-DTPA-enhanced MR images: Histopathologic correlation. Eur Radiol 1998;8:746-8. Ryken TC, Frankel B, Julien T, Olson JJ. Surgical management of newly diagnosed glioblastoma in adults: Role of cytoreductive surgery. J Neurooncol 2008;89:271-86. Lacroix M, Abi-Said D, Fourney DR, Gokaslan ZL, Shi W, DeMonte F, et al. Amultivariate analysis of 416 patients with glioblastoma multiforme: Prognosis, extent of resection, and survival. J Neurosurg 2001;95:190-8. Ciric I, Ammirati M, Vick N, Mikhael M. Supratentorial gliomas: Surgical considerations and immediate postoperative results. Gross total resection versus partial resection. Neurosurgery 1987;21:21-6. Fadul C, Wood J, Thaler H, Galicich J, Patterson RH Jr., Posner JB, et al. Morbidity and mortality of craniotomy for excision of supratentorial gliomas. Neurology 1988;38:1374-9. Sawaya R, Hammoud M, Schoppa D, Hess KR, Wu SZ, Shi WM, et al. Neurosurgical outcomes in a modern series of 400 craniotomies for treatment of parenchymal tumors. Neurosurgery 1998;42:1044-55. Signorelli F, Ruggeri F, Iofrida G, Isnard J, Chirchiglia D, Lavano A, et al. Indications and limits of intraoperative cortico-subcortical mapping in brain tumor surgery: An analysis of 101 consecutive cases. J Neurosurg Sci 2007;51:113-27. Sloan AE. Glioblastoma in the elderly. J Neurosurg 2012;116:355-6.